Kermit Davis and the Ole Miss Rebels are back in the tournament and looking to cause some chaos. 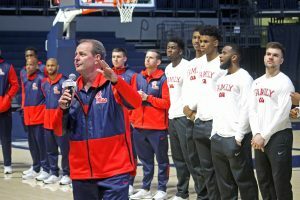 It’s well-documented that Kermit Davis and his staff have been the driving force behind the resurgent Rebel hoops squad that went 10-8 in the league, giving teams like Tennessee and Kentucky fits, just a year after finishing at the bottom of the conference standings. Davis has the SEC Coach of the Year award and a fresh contract extension to back that up. Davis’s stellar coaching job has guided Ole Miss to its ninth appearance in the NCAA Tournament and first at-large bid since 2002. Davis is no stranger to the Big Dance, and he’ll tell you himself that this is the expectation for his teams. He’s led five other squads to the tournament: the first in 1989 in his debut season at Idaho and the most recent in 2017 at Middle Tennessee. In the five seasons that have resulted in trips to the tournament, Davis has generally found success in the same way, using experienced upperclassmen to lead a few complementary freshmen and sophomores. In the one-and-done era, it’s usually the other way around for Power Five teams. However, the actual journey to the tournament has been different for Kermit Davis this year. Every one of his previous tournament teams has had to win more than 25 games, win the regular season conference title or win the conference tournament to make it to the dance. This team has won 20 games, finished sixth in the regular season and lost in the second round of the SEC Tournament, but made it to the tournament comfortably with a higher seed than any of Davis’s previous teams. While the meeting between Ole Miss and Oklahoma on Friday is an even matchup, it will be the first time a Kermit Davis-led team goes up against a team with a lower seed in the dance. Davis has managed a 2-5 record as the underdog in the tournament, advancing past the first round in 2016 and 2017. His 2016 Middle Tennessee squad entered the dance as a 15 seed and stunned the 2 seed Michigan State in what was the biggest upset in the history of the tournament at the time. They’d later fall in the second round to Syracuse, who would advance to the Final Four. In 2017, the Blue Raiders defeated 5 seed Minnesota as a 12 seed and lost to 4 seed Butler in the second round. Butler advanced to the Sweet Sixteen that year. This also isn’t the first time Kermit Davis has surged a program into the tournament in his first season at a school. Davis led the Idaho Vandals to a tournament appearance in his first coaching job. Both the 1989 and 1990 Idaho teams were 25-6 and got into the tournament as 13 seeds. Both teams were bounced in the first round, and Davis left for Texas A&M the next season. Idaho hasn’t been back to the tournament since. Should this Ole Miss team have the same fate as the 1989 and 1990 Vandals and get eliminated in the first weekend, it’s still an enormous accomplishment for Kermit Davis and the team. A victory over Oklahoma in the first round will likely give the Rebels a Sunday date with Kyle Guy and the top-seeded Virginia Cavaliers, a team that has only lost three games all season. Two of the Cavaliers’ losses came against the stacked Duke squad, and the third was last week in the ACC Tournament semifinal against Florida State.